The woman who created the most popular album in the U.S. last year had a trying Grammy Awards. LOS ANGELES (AP) — The woman who created the most popular album in the U.S. last year had a trying Grammy Awards. 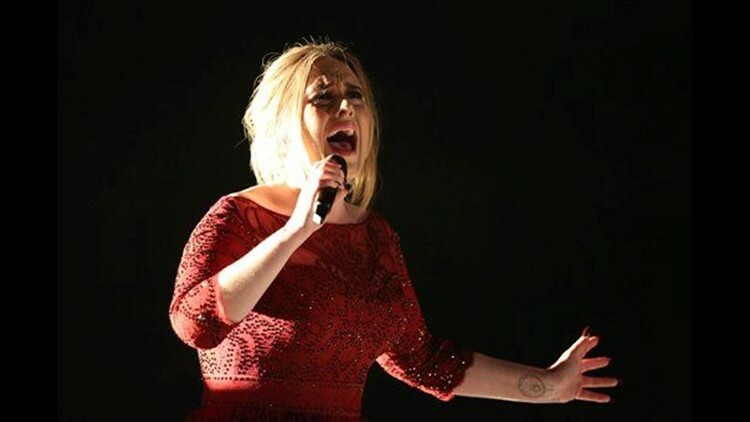 Recording Academy president Neil Portnow said there was a "technical glitch" after a microphone inside a piano fell onto the instrument's strings during British superstar Adele's performance Monday night of the tender "All I Ask." The result was that the hitmaker sounded very mortal — TV audiences heard a pitchy song and saw an unsettled Adele, who appeared disconcerted when the song ended. The singer later consoled herself by getting a burger from a popular local joint. "Something like that can easily be distracting or off-putting," Portnow said. "To her credit, she killed it. She did a fantastic job. That was an issue on our behalf." Portnow said the mic fell when the piano was lifted onto a satellite stage located in the audience at Staples Center. "It means when the hammer of the piano hits the strings it sounds like something is in there," he said backstage after the CBS telecast ended. Portnow said the sound was switched to a backup system, but that involved cutting off the original system. "You had a couple seconds where you did not have audio in the house," he said. "It was fixed in a matter of seconds, but we've never happy when something like that happens." It was one of a few episodes during the telecast that had some users of social media fuming about mismatched singers or sound problems. Even access to the live stream had reported glitches. Sam Hunt and Carrie Underwood had an early medley of songs that had one commentator declare, "This performance is the worst." Another wanted to know: "Who is mixing the audio at the Grammy's?" Paul Inder, the son of Motorhead frontman Lemmy Kilmister, was critical of the audio mixing during the Hollywood Vampire's tribute to his late father. Inder said backstage that while he appreciated the segment featuring Alice Cooper, Joe Perry and actor Johnny Depp, he couldn't hear Depp's guitar very well and blamed the audio mixing. The show had 16 live performances and Portnow noted that each one required different sound, lighting and set-up done under tight time constraint by what he called "an A-plus crew." "Our show is the most complicated in terms of audio of any show on television," he said. "We rarely have technical issues." The audience never saw two other scheduled performers. An ill Rihanna was a late no-show on doctor's orders to rest her vocal cords for 48 hours. Lauryn Hill didn't appear after being invited by The Weeknd to join him for the second of two songs, which was intended as a surprise for the crowd. Portnow said she attended rehearsal Monday morning and then didn't return for the evening show. In a statement, Hill's representative offered a different version of events, which Portnow said was inaccurate. The night's final two awards were given out by people different than what was listed on the order of presentation handed out before the show. The original order indicated Earth Wind & Fire would present record of the year and Beyonce would announce album of the year. Instead, the '70s funk band announced Taylor Swift as album winner for "1989" and Beyonce presented Mark Ronson and Bruno Mars with record honors for "Uptown Funk."